Successfully using all of the desktop mixing features in Telestream Wirecast features requires a powerful, finely tuned computer. Telestream recently released its own series of bundled systems, Wirecast Gear. In this review, we put a test system through its paces. 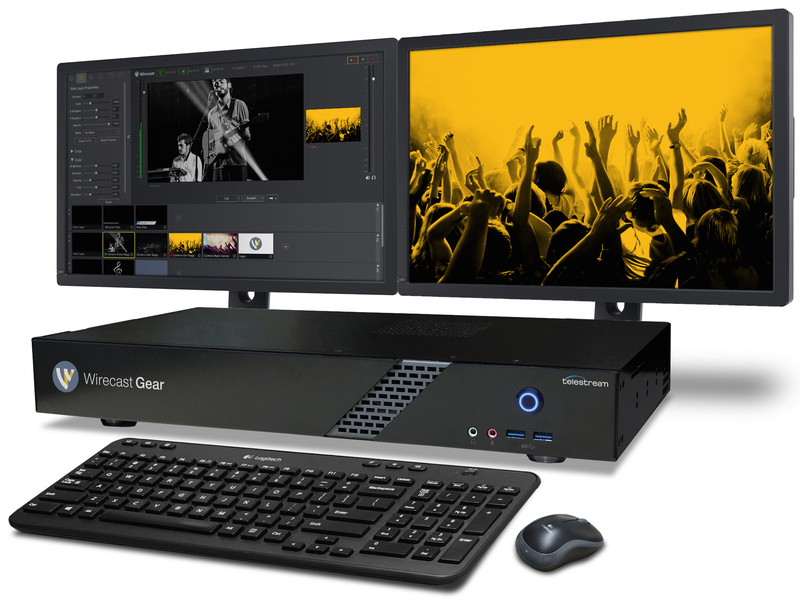 Telestream Wirecast is a highly featured and well respected desktop video mixer with one traditional Achilles Heel: CPU utilization is generally higher than competitive products on similarly configured computers. Though Telestream has narrowed the gap in recent Wirecast releases, successfully using all Wirecast features requires a powerful, finely tuned computer. 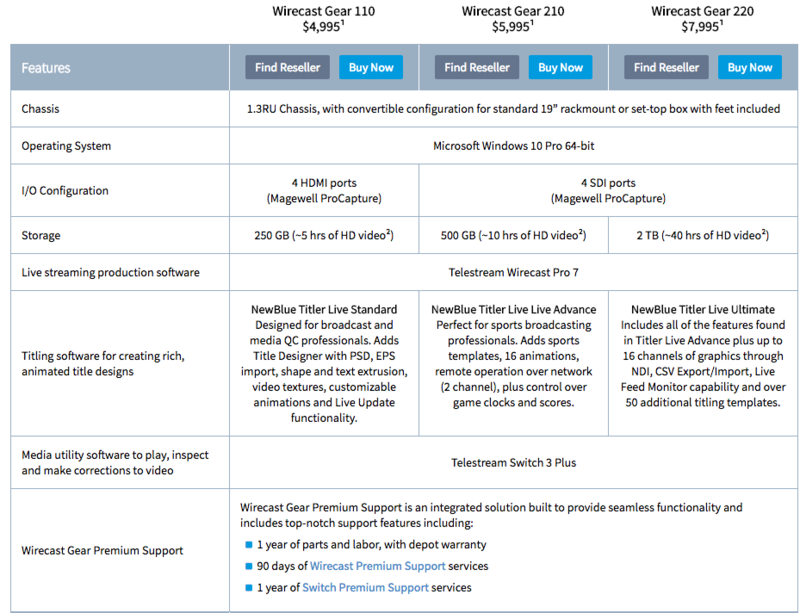 To help Wirecast users acquire such a system, Telestream recently released its own bundled systems under the brand name Wirecast Gear (Figure 1, below). In this review, we put a test system through its paces. By way of background, there are three Gear versions: 110 ($4,995), 210 ($5,995), and 220 ($7,995), which vary by capture card and software offering. I tested the 210 version, which included a 4-port Magewell HD-SDI ProCapture board, 250GB system drive, a 500 GB SSD drive, and the software listed in Figure 2 (below). All three come in a 1.3 RU chassis which can fit into a 19" rackmount or sit atop a desk or table on rubber pads. My test system came with an Intel i7-6700 CPU running at 3.4 GHz, with 16GB of RAM running Windows 10. The motherboard was a Gigabyte GA-Z17ON-WIFI running an Intel Z170 Express Chipset with integrated HD graphics, with a DVI-D graphics port with a maximum resolution of 1920x1200, and two version 1.4 HDMI ports capable of 4K output at 24 fps. To save you some time, I priced the CPU (~$300), motherboard (~$140), RAM (~$120), case, power supply and CPU fan (~$250), Magewell Pro Capture Quad SDI (~$900), and system (~$100) and storage (~$150) SSD drives for a hardware cost of about ~$1,960. To this, you have to add Wirecast Pro ($995) and the upgrade to NewBlue Titler Live Advance ($499) for a total system cost of about $3,454, which could be off by $100-$200 in either direction. Compared to the retail of $5,995, this means a premium of around $2,500. With Wirecast 5, Telestream has significantly improved usability with a redesigned interface, beneficially expanded the product's input capabilities, and upgraded the product's plumbing with features like x.264 encoding and HD-SDI output via Blackmagic Design Intensity or DeckLink cards. Learn more in this video tutorial that guides you through the new release. In this tutorial, we'll demonstrate how to use the Teradek StreamReader plug-in to stream directly to Telestream Wirecast and NewTek TriCaster. With version 6, Telestream has converted its premier live production software application to 64-bit operation, which should enhance performance and stability. Telestream also added several key features, including playlists, social media support, input from iOS devices, and instant replay. This tutorial details how to stream video conferences using the new Rendezvous feature introduced in Telestream Wirecast 8. Jan Ozer discusses bandwidth, latency, and other issues associated with on-prem and cloud-based streaming solutions in this clip from Live Streaming Summit West. If you're producing live events at sports venues, house of worship, or any other multi-camera shoots, the Gear 230 gives you all the features and capabilities you'll need to land jobs and satisfy your clients.